"This is the true story of a farmer who set out to grow a garden in the middle of Milwaukee. As a child, Will Allen disliked working in his family's garden, but when he was living in Belgium and playing basketball professionally, he discovered that he loved gardening. Upon returning to the states, he purchased greenhouses in Milwaukee and recruited children to help make the soil healthy and grow food to share. Eventually, Allen involved more of his community and soon grew enough to sell produce to neighbors and restaurants. He began traveling around the world teaching people how to become farmers themselves. Narrator Peter Jay Fernandez does a lovely job of reading the story, which is interspersed with sound effects and musical interludes to indicate new sections. Children will enjoy listening while following along with the accompanying book. Will Allen reads his afterword and Martin reads the author's note. 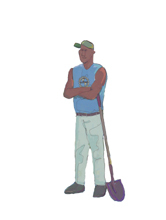 Gardening resources for children are included along with a link to martin's resources. This is a wonderful addition to any library's non-fiction collection"
"Fernandez enthusiastically narrates Martin’s picture-book biography of Will Allen, the professional basketball player who became an urban farmer. Fernandez uses a voice that is clear and well modulated, and he reads slowly enough for young readers to follow along in the book. He switches emotions easily, from jolly, when talking about Allen’s personality, to discouraged, when talking about the polluted soil of his city lots. The narration is backed by related sound effects, like the laughter of Farmer Allen, the clinking of dishes and silverware, and the sounds of people eating together around a table. The audio includes two tracks: one with page-turn signals and one without. Both versions include an afterword read by Will Allen and an author’s note read by Martin." "Can you say "red wiggler worms" in a way that no one will forget? Narrator Peter Jay Fernandez can! He brings drama to the inspirational story of former basketball player and MacArthur award recipient Will Allen and his quest to bring fresh vegetable gardening into the urban setting. Cherishing the gardening, food, and friendship of his childhood, Will has a vision of "city farms as common as street lights and every table covered with good food." Fernandez's voice is firm, and his narration purposeful. He lets questions percolate: "HOW could Will farm in the middle of pavement and parking lots? ", for example. Background music and sound effects accompany the story. To complete the production, Allen adds an afterword, and author Jacqueline Briggs Martin shares her thoughts."